At Jim Ryan Carpet Repair, we provide a comprehensive list of carpet repair and installation services to our valued customers in Jacksonville, FL and the surrounding areas. With over 20 years’ experience, you can feel confident knowing that we provide a level of experience, skill and knowledge that can’t be touched by our competitors. A professional carpet installation, when correctly installed should never require re-stretching. If you are experiencing carpet ripples, bunched up carpet or wrinkles, we recommend having your carpets re-stretched. Depending on the extent of the stretching our professional carpet repair technicians can re-stretch the carpet using a power carpet stretcher to ensure your carpet has a nice snug fit. Sometimes the damage is extensive and may require the seams to be taken apart and re-stitched to ensure you receive the best quality results possible. If you have a permanent carpet stain that is ruining the overall appearance of your residential or commercial carpet, the knowledgeable carpet repair technicians at Jim Ryan Carpet Repair have a solution. Carpet patching is cost effective and our carpet repair technicians will ensure that the area has a perfect fit with no overlapping or gaps at the seam. Since it is almost impossible to find a piece of carpeting that is a perfect match, we can repurpose a piece of carpet from a closet and then replace the closet carpet with a carpet remnant. No matter how careful you are, it’s almost inevitable that the carpet on the first and second stair will wear out first. The experienced carpet repair technicians at Jim Ryan Carpet Repair have a cost effective way of saving you money by using carpet from the original installation or from a built in closet. If more than a stair or two needs to be replaced we can replace the stairway carpet with matching carpet from a different room. Replacing the carpet from a spare room that isn’t used very often will save your time and money. It’s less expensive to replace the one room than to re-carpet your entire home or business and you have the added benefit of stair carpet that will continue to match the carpet in the hall and rest of your home or business. Our qualified technicians can repair damage caused by dogs and cats by providing a cost effective solution to removing stains and odors. For stubborn stains that are permanent, our carpet repair technicians can replace a damaged carpet with a carpet patch. For more extensive staining and persistent odors caused by urine, our expert technicians can remove the affected carpet along with the carpet padding before cleaning and deodorizing the floor under the carpet. 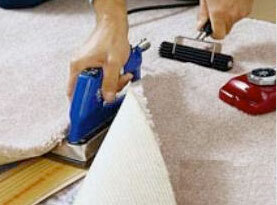 Removing carpet and carpet padding can we done is a few different ways depending on your objective. If you want to save the carpet to be used in a different room our technicians will keep the carpet in one piece. 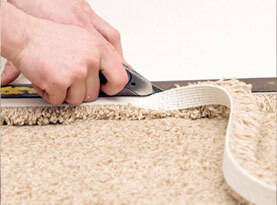 If you just want us to remove the carpet and carpet padding for new installation with no thoughts or repurposing the old carpet, our technicians will remove the carpet by cutting it into strips for easy disposal. 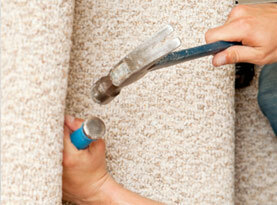 At Jim Ryan Carpet Repair, our master installation specialists will professionally install your brand new carpet. Our specialists will work with you to help you select carpet that fits your lifestyle and specific requirements at prices that you just won’t be able to resist. We can even install already purchased carpet. Your complete satisfaction is guaranteed!